Malaria can start with a single mosquito bite therefore every community member needs to have access to personal protection from mosquitoes. This can be in the form of cost effective mosquito repellents being made available locally and also each family member having a treated mosquito net to sleep under. Nevertheless this is not the whole solution, those people who do contract malaria need fast access to efficient methods of identifying the type of malaria they have. 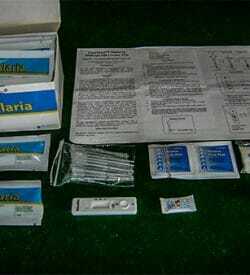 Given the right conditions Pf Malaria can be fatal within hours of the symptoms of Malaria first appearing. In poorer nations a patient who is suffering from Malaria may present at a clinic seeking medical assistance. If testing is available at that clinic a blood sample may be taken and sent to the laboratory for testing and identification. In the meanwhile a cheap, broad based anti-malarial medication such as Chloroquine may be given as the treatment regime until the tests from the laboratory confirm the type of Malaria involved. Chloroquine can be an effective treatment for uncomplicated forms of Malaria as long as the parasites have not developed a resistance to it. However, anti malarials such as Chloroquine are not recommended by the WHO as an effective treatment for Pf Malaria. The medications needed for that are more expensive and may not be readily available to a local village clinic. 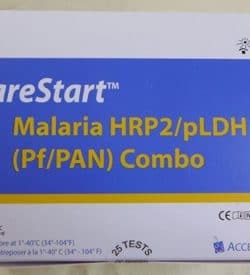 It is therefore possible that the patient with Pf Malaria could die before the results of the tests are known, despite being treated by broad spectrum medication. The successful treatment of Pf Malaria is greatly improved if effective anti-malarial medicine can be given as early as possible. Delays due to overworked or under resourced laboratories can cost lives. 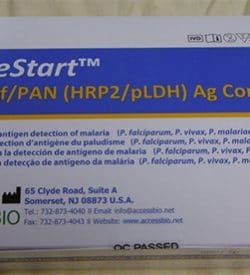 Over the years Rapid Diagnostic Testing (RDT) kits that have been developed that are low cost, have up to 90% accuracy and can show within 30 minutes whether a person has Pf or another form of Malaria. Through the effective application of such testing kits pressure can be taken away from hospital laboratories, and patients can be speedily diagnosed. This will save lives. There are different variations of the RDT kits that are manufactured in several countries. Although prices vary depending on the location, the cost of each single use kit ranges between $US0.67 to $US2.00. These kits rely on a simple blood test and that can be easily administered with minimal training. In under 30 minutes the kit will confirm the presence of Pf Malaria. If Pf Malaria is found to be present an appropriate treatment regime must be entered into as quickly as possible. Buzz Off encourages the use of these testing kits and as part of its strategy is training local health workers in their use. Buzz Off is also supplying kits to local clinics.